Braving this week’s heat wave, hundreds of students waited in a line that wrapped around the DeBartolo Performing Arts Center (DPAC) last night, hoping to be one of the few students who would secure a seat at an event featuring Supreme Court Justice Sonia Sotomayor when general admission tickets were released at 6 p.m.
“We heard the line was going to be out the door by 3 p.m.,” junior Leah Billion said. Though perhaps slightly exaggerated, the prediction warranted some merit; junior John McCready said that by the time he arrived at 4:30 p.m. there were nearly 50 people in front of him in line. Sophomore Emmy Schoenbauer was the last person in the general admission line who was able to get a ticket. 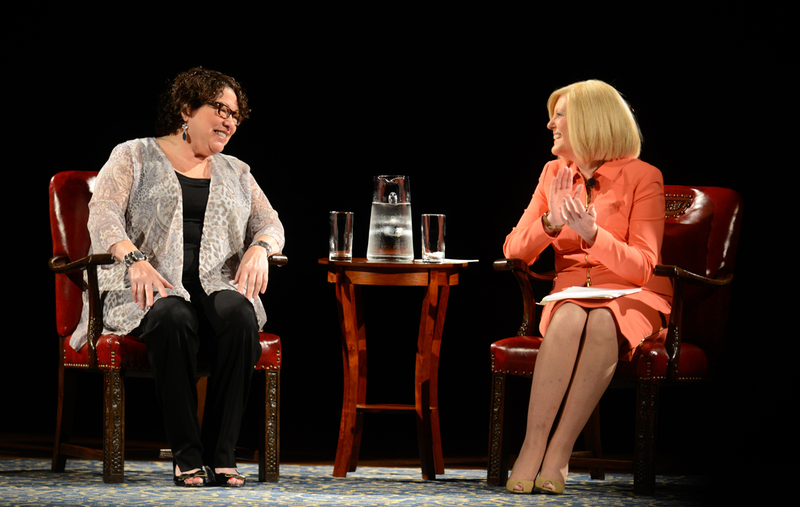 Those who were unable to get tickets in the Leighton Concert Hall, where Sotomayor spoke, had the opportunity to watch the event live streamed in the lobby and in Decio Theatre. Sophomore Cameron Engel, one of those who watched the event from the overflow area, said Sotomayor came out before the program and began to address the people unable to get seats. Other students echoed this sentiment; Billion said she found herself impressed by Sotomayor’s ability to relate to her audience. Senior Elizabeth Anthony said she had not been particularly familiar with Sotomayor prior to going to the event, but she found great insight in what the Justice had to say. “The way that she articulated things that I had thought before and things that I knew I wanted to hear from somebody in the Supreme Court but that I had never heard somebody say before, she articulated that very well,” she said. While junior Rachel Ganson said she enjoyed what Sotomayor talked about, she stressed more broadly the importance of taking advantage of opportunities like this one on campus.